The idea behind this registry tweak is to adjust the label under the computer icon, which you see on the Vista desktop. The result is that the name reflects the true username and computername. For example, guyt (username) at Vista-Ultimata (computername). Please note, unlike the cheap-shot where you just rename the Computer icon; this tip dynamically adjusts the name for each user who logs on. Before you try this impressive registry tweak, make sure that the Vista desktop displays the Computer icon. Right-click the desktop, Personalize and select: Change Desktop Icons. This tip also works for XP and W2K3, in these cases, make sure that you display the ‘My Computer’ on the desktop. The mission is to find a specific class id (CLSID) in HKEY_CLASSES_ROOT, and then change the value for LocalizedString from ‘Computer’ to a variable which will reflect the user who logs on to this particular computer. Incidentally, you could choose more creative words in place of ‘at’. For example, ‘King of’ or ‘Queen of’. 3) To see the fruits of your labours, just press F5 to refresh the desktop, your computer icon should now say the equivalent of: YourName at YourComputer. (See screenshot at the top of this page). Here is a panoramic view of the registry, which shows regedit displaying the REG_EXPAND_SZ LocalizedString. Before you make a difficult change to the registry, rename the existing key. Preliminary step, make sure that Vista displays the Computer on the desktop. right-click, Personalize and select: Change Desktop Icons. Do you find the LocalizedString value in HKCU** or HKLM? Answer: neither, it’s under HKEY_CLASSES_ROOT. Answer: Rename, then create a new value. Answer: Neither it is an Expanded String. Answer: Neither, just refresh the desktop by pressing F5. This page explains how to create, and then edit .reg files for your computer. As it’s easy to import the contents of a .reg file into the registry, do take extra care with procedures. 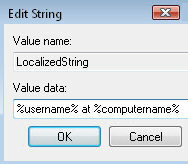 Example LocalizedString .reg file.